Veteran actress Lauren Bacall has labelled co-star Nicole Kidman a "beginner" after an ITV presenter described Kidman as a "legend". "She's not a legend. She's a beginner... she can't be a legend at whatever age she is," Bacall told GMTV. Kidman, 37, and Bacall, 79, are at the Venice Film Festival to promote their film Birth. Bacall plays Kidman's mum. Bacall told a recent press conference she and Kidman had a "fabulous relationship both on screen and off". "I love working with a young actress," said Bacall. The pair also appeared together in Lars von Trier's Dogville last year. Security has been stepped up following the arrival of Kidman in Venice, after a series of gaffes at Al Pacino's premiere on Tuesday. Pacino ended up with no seat at The Merchant of Venice, with a computer glitch being blamed for producing 200 too many tickets for the event. The screening was also delayed after several hoax bomb threats. More time will be given before Kidman's premiere of Birth, so that seats can be checked for explosive devices. The controversial film, which features Kidman in the bath with a 10-year-old boy who her character believes is a reincarnation of her dead husband, was booed by journalists at a preview screening on Wednesday. Kidman also kisses the boy in the movie. "It wasn't that I wanted to make a film where I kiss a 10-year-old boy, I wanted to make a film where you understand love," said Kidman. Director Jonathan Glazer said: "You can't aim to please everyone. I would hope I only make films that some people like and some people don't." Kidman arrived in Venice on Monday, three days after her former husband Tom Cruise left, having promoted his movie Collateral. Meticulous security checks caused by the influx of big name stars at the festival has been blamed for problems at festival. "The world is a dangerous place right now and with so many Hollywood stars here this year, security is more of a priority than ever," a festival spokeswoman said. "Of course, we know the threats are probably a hoax but we have a duty to check each one," she added. 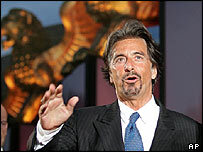 Producers of Pacino's film insisted the actor was happy with the event and would be back in Venice "very soon". Miramax boss Harvey Weinstein found his film, Finding Neverland, pushed back to a 2am screening because of the knock-on effects of the delays. He joked he would drown the festival director in the lagoon "with his feet encased in cement". Kate Winslet, who stars in the film about the life of Peter Pan author JM Barrie, said: "You have to be game for anything in this business."